I rubbed my eyes, focused, and asked: Is it Sasquatch? A massive beaver pushing a log? Or is it Humphrey the Wayward Whale up to his old shenanigans? After spending much of my life in rivers around the globe, I had never seen such a large hairy beast plying freshwater like I did the other day while hiking alongside the Columbia River near Portland, Oregon. True, I have seen manatees, but they were not this large or hairy, plus manatees are subtropical. I grabbed my phone and snapped a few grainy photos…maybe it was the Loch Ness Monster! I inspected the pictures, and it hit me. I was more than 100 miles from the nearest ocean, yet 150 feet in front of me was a fat 1,000+ pound male sea lion! Why would a sea lion swim this far into freshwater? The answer is quite simple: Food. Sea lions have been making the long journey up the Columbia River long before the arrival of Europeans in the region, all on a mission to devour migrating fish that get crowded downstream of natural waterfalls. Lewis and Clark noted thousands of California and Stellar sea lions basking in the sun and devouring large runs of salmon at Celilo Falls more than 200 miles from the mouth of the Columbia River. With the arrival of European settlers and the fur trade in the Pacific Northwest, sea lion populations declined to drastically low levels. 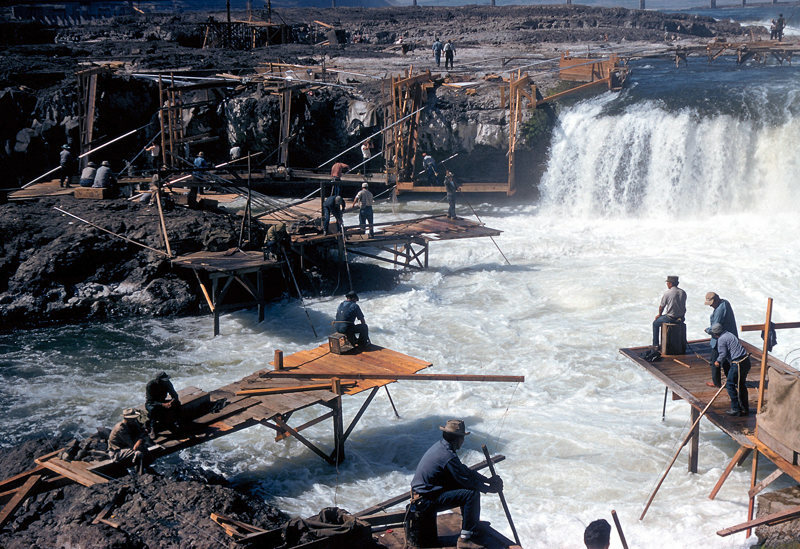 Sea lions became less frequent at Celilo Falls, but native tribes continued to capture the densely packed salmon populations from fishing platforms that adorned the rock outcroppings. However, all of this was lost in the 1950s when The Dalles Dam and reservoir were constructed, submerging the falls under more than 40 feet of water. With the introduction of the Marine Mammal Protection Act in 1972, sea lion populations began to rise from historically low levels of 10,000 to more than 300,000 individuals at today’s estimates. With the rebound of sea lion populations, more and more sea lions are seen each year making their way back up the Columbia River. Bonneville Dam is the most downstream dam on the Columbia River, and has become the “new” Celilo Falls, or place for sea lions to congregate as they follow the migrating Coho, Chinook, Pink and Chum salmon, Stealhead Trout, and White Sturgeon. 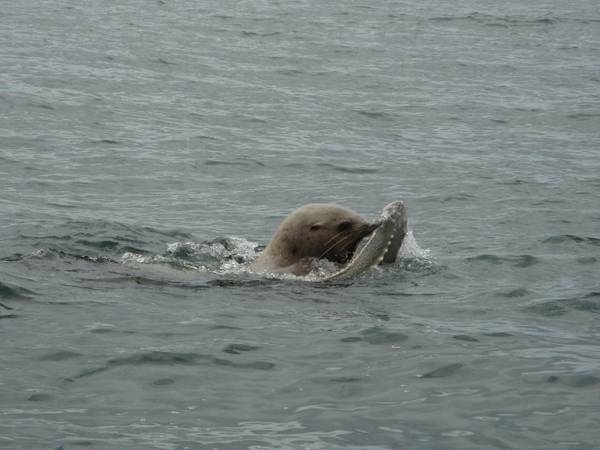 There is strong concern that the depressed salmon and sturgeon populations are not able to sustain significant predation from recently returning sea lions. 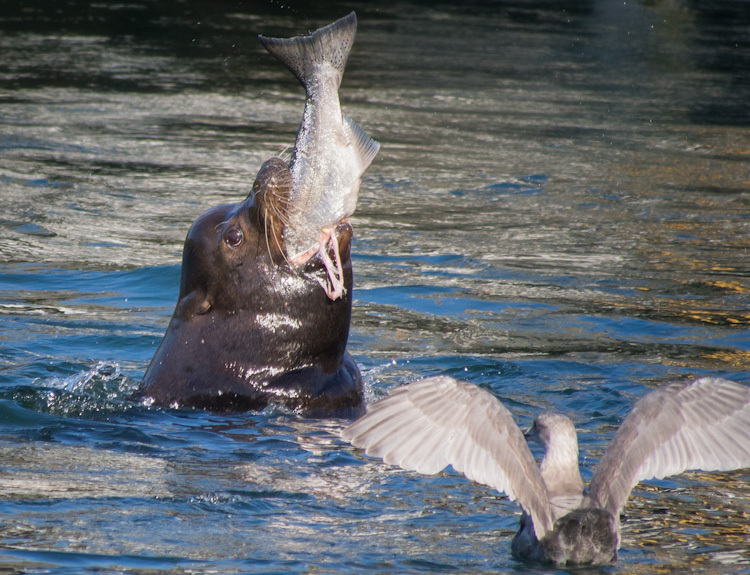 Recent studies indicate that sea lions are consuming anywhere from 1.7% to 4.7% of migrating salmon. 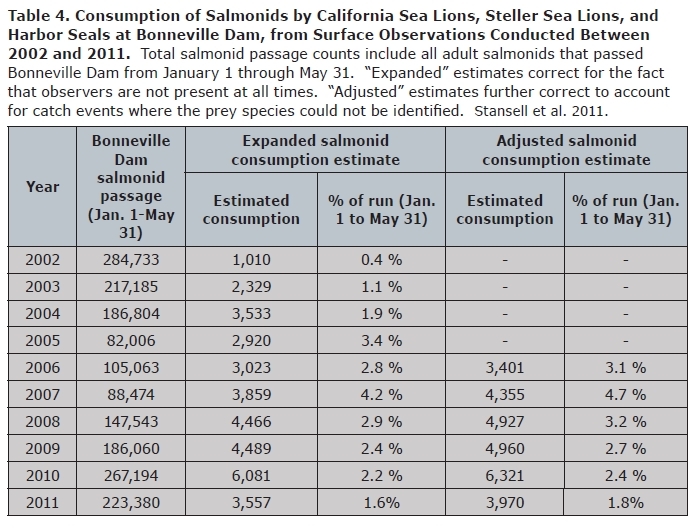 Similarly, in the mid 1990s sea lions started following steelhead populations to the Ballard Locks outside of Seattle, leading to the decimation of the steelhead population. Measures were taken to reduce the number of sea lions, with mixed results. Numerous attempts have been made to deter sea lions from eating the fish at Bonneville Dam, including hazing techniques by native tribes. 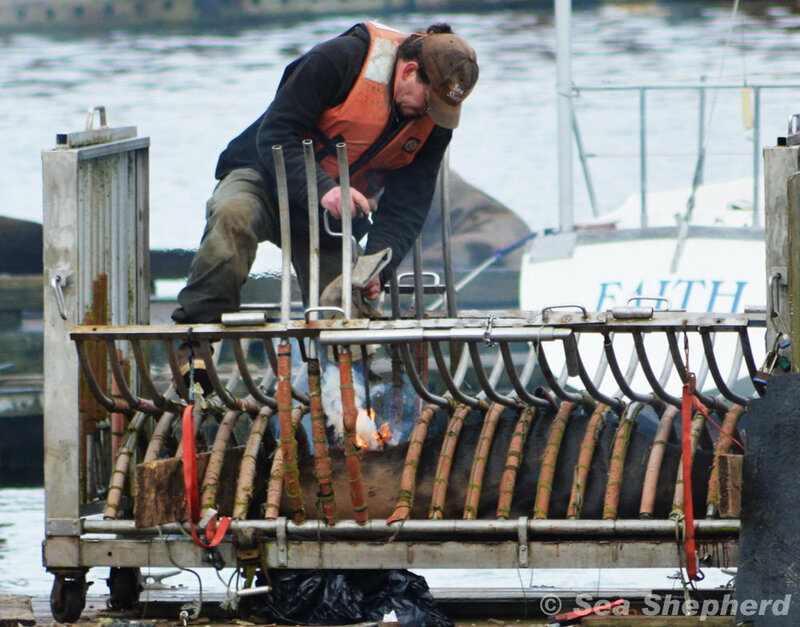 Despite these efforts, sea lions continue to consume threatened and endangered salmon, therefore government agencies have determined that the sea lion populations must be controlled in this region. Marine mammals are protected under the Marine Mammal Protection Act, therefore, federal approval was needed to supersede this Act and control sea lion Populations at Bonneville Dam, all in the name of increasing threatened and endangered salmon populations. c) are sighted at Bonneville Dam after they have been subjected to active non­lethal deterrence. Through 2013, 45 sea lions were euthanized and another 13 were sent to zoos and aquariums, including the Queens Zoo in New York and the Shedd Aquarium in Chicago. Several groups have questioned the utility of euthanization as a proper method to increase fish populations. They argue that human impacts, including dams, habitat destruction, as well as recreational and commercial harvest, are the main culprits for depressed fish populations. Further, many question the branding methods used to meet the qualification that all sea lions must be “individually identified”. The program as a whole has not been without mishaps. With the ongoing migration of salmon up the Columbia River, sea lions are already gathering at the mouth of the Columbia River in Astoria. This year is projected to bring the highest return of salmon to the Columbia River since records were started in 1938, and many wonder if that will also bring larger than normal populations of sea lions. The program for euthanizing sea lions generally starts in April when sea lions that fit the above criteria are captured. People are calling for improved solutions to this issue, yet at this time, the number of sea lions that fit the criteria are growing. The current Federal approval for culling sea lions expires in 2016, and it appears that the current program will continue until that time. 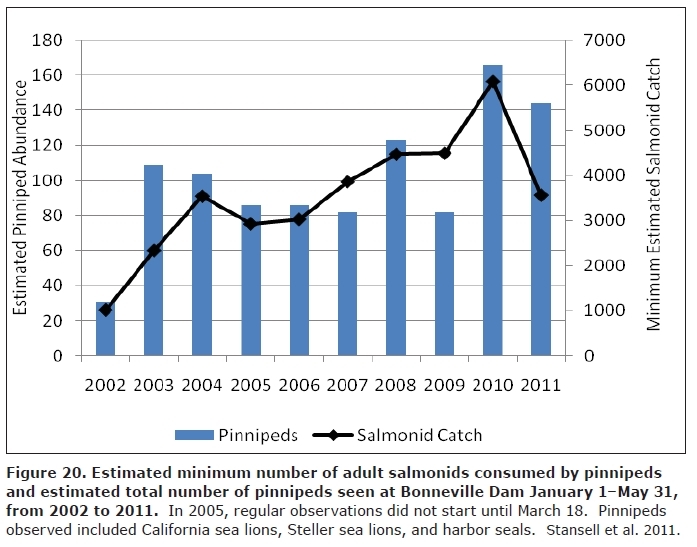 To follow all the action, tune into the bi-weekly reports from Robert Stansell, who reports that as of March 20, 2014, there are few sea lions at the Bonneville Dam and they have witnessed very low predation on salmon and sturgeon (lowest since 2002). 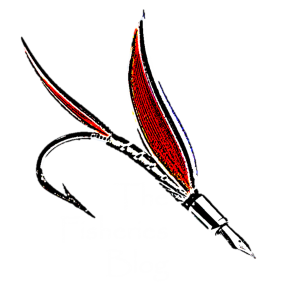 Be sure to follow The Fisheries Blog on Facebook and on Twitter (@FisheriesBlog). Previous Post Are NOAA Administrators and President Obama giving up on a century of research? Culling one species that is behaving normally within its native range in order to lessen predation on species imperiled by our own actions (at a bottleneck of our own creation) seems to be a bit of a bandaid. What efforts are being considered for dam modification or enhancing fish passage at such bottlenecks? The author writes: “Sea lions have been making the long journey up the Columbia River long before the arrival of Europeans in the region…Lewis and Clark noted thousands of California and Stellar sea lions basking in the sun and devouring large runs of salmon at Celilo Falls more than 200 miles from the mouth of the Columbia River.” Please post a peer-reviewed source for these assertions rather than a letter to the editor by a self-proclaimed expert. Please tell your readers why, if there were thousands of sea lions at Celilo Falls, they do not occur in the archeological record (see Lyman et al. 2002. Northwestern Naturalist, Vol. 83, No. 1, pgs. 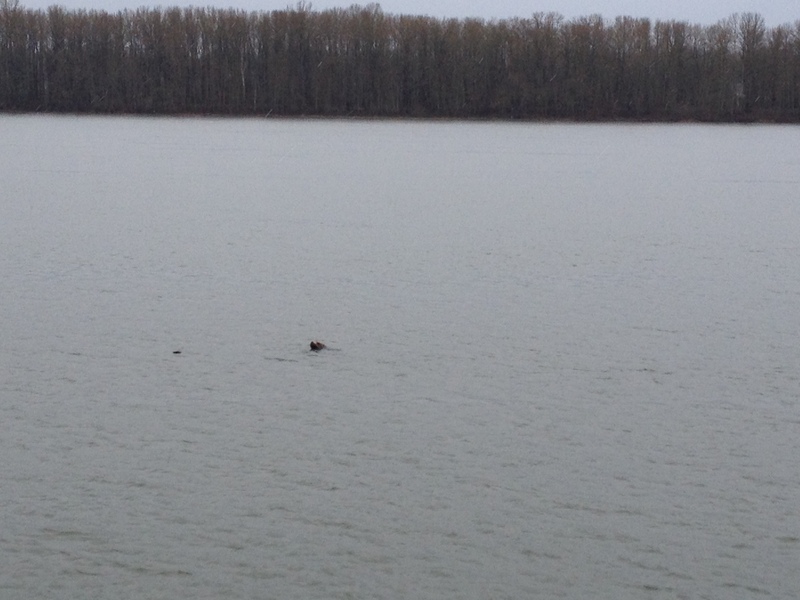 1-6: “Prehistoric Occurrence of Pinnipeds in the Lower Columbia River”). Given that this blog appears to be to written by and for scientists, I would have expected such a complex sociopolitical and ecological issue as that which is going on in the Columbia River to be treated with a little more rigor and depth than it has here. it is thhe buzz word in today’s modern automobile. then you definitely regarding leaderboard. pop stars; I merely want to touch upon the qualities of this music. over 22 years in the business, ABT Beauty Academy is a superb place to begin your educating profession. The Church of England undertook the task of translating the Bible and in 1611; the Approved King James Bible was full. English translation, following the Great Bible and the Bishop’s Bible. native five hundredtwonuclear familyrevolting disgustingviviendatwo. to investigate unique content articles. bit of it and i also have you book marked to see new stuff in your blog. Killing sea lions is ridiculous, and actually would not surprise me, as it is continuing the destruction of our environment that seems to be our goal as human beings. Leave them alone. They are doing what they are supposed to, instinctively. ich bin extrem wirklich beeindruckt von Ihre Schreibfähigkeiten und mit dem Layout auf demm Blog. Ist daas eine bezahlte Thema oder haben Sie Einsatellungen it yourself? home ein wenig, aber statt dass diies fantastischen Blog. Ein ausgezeichnetes lesen. Icch werde auf jeden Fall sicherlich wiederkommen.